Hello lovely ladies! These photos were taken this weekend on a very gorgeous day – it’s already starting to heat up around here! I foresee many pool days in my future. Anyway, I had just colored my hair, and I must say I’m absolutely in love with it. I’m most comfortable with super light blonde hair, but as I get older, I started wishing that my lovely blonde locks had a more natural look to them. Therefore, I asked my amazing stylist, Ashlie, to color my hair in more of a Lauren Conrad tone. She did an absolutely fabulous job, and it seems as though this may be a little more low maintenance for summer. My hair is growing super fast, but not fast enough! Trying to be patient here. Anyway, I absolutely adore this sundress. It is classic, fun, super light, and airy. 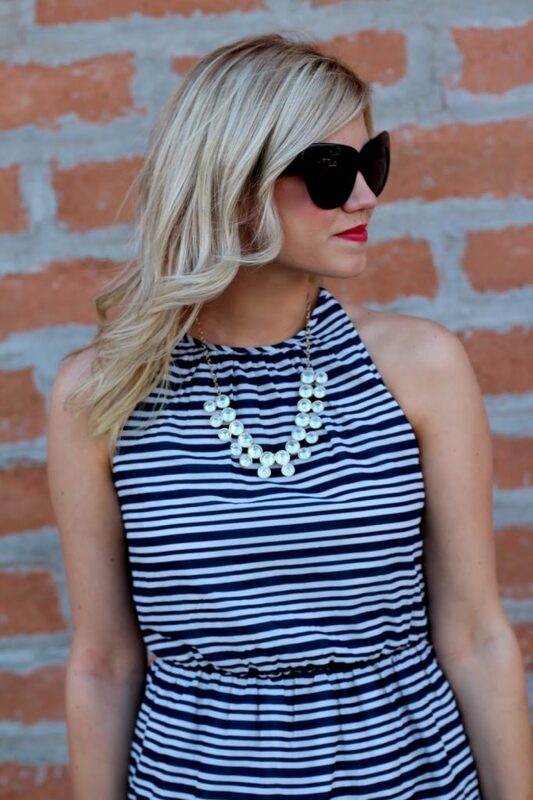 The neckline looks great with a statement necklace, and for work last week I paired this with a denim jacket. I think the smaller stripes on my TOMS wedges just complete the look for a tiny bit of pattern mixing. I like this dress a lot! You look so pretty! Fun dress. I like the bit of neon. I also really like your purse. I love Mr. Kors. your hair look fantastic! definitely loving the darker blonde look these days. can't believe your dress is from ON! it's super cute. This dress looks great on you, love the colors. 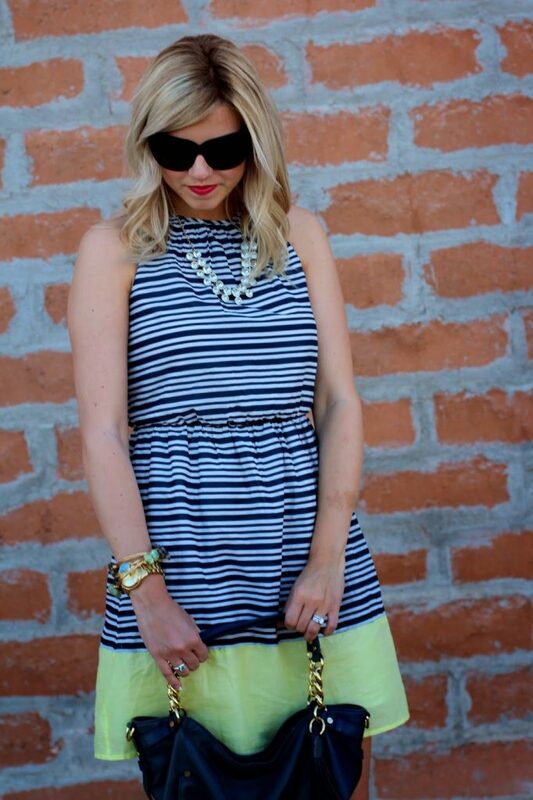 Love this dress…especially the pop of neon! 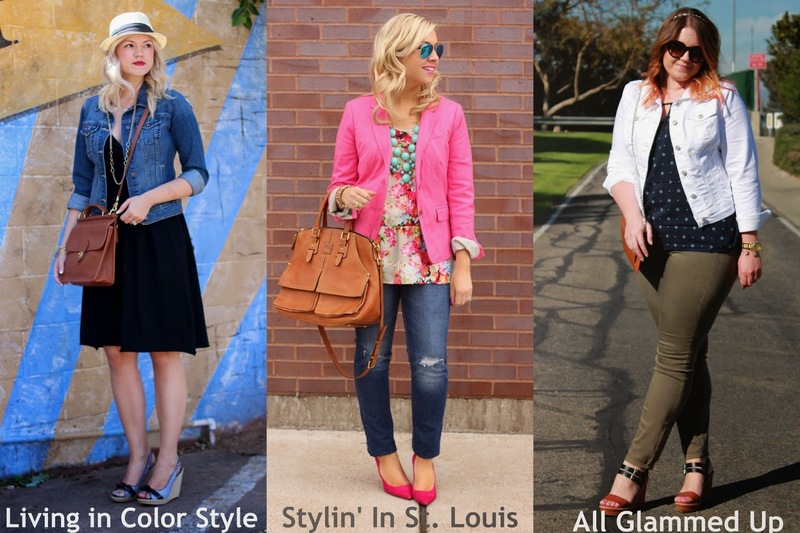 Cheers to Old Navy and their great pieces this spring! 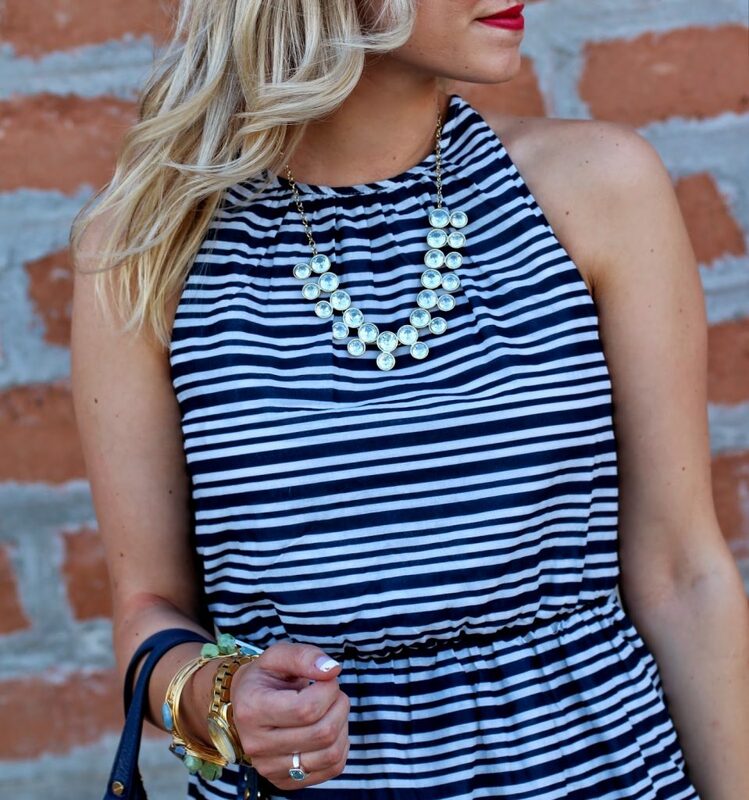 This is a gorgeous dress – the neon hemline is super springy! Love the entire look! How amazing is this weather!? Love your dress!